Dog Rules: Dogs must be on-leash near picnic tables but are allowed off-leash in the rest of the park, if under voice control. 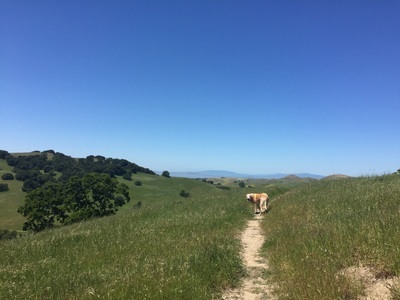 Bring a leash in case you encounter grazing cattle. 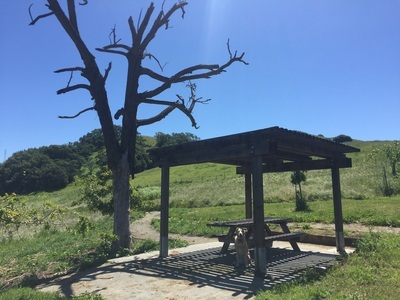 Best time to visit: Morning or on a cloudy day. 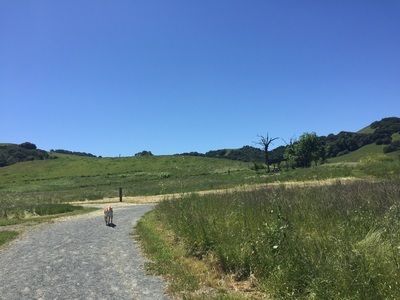 The initial trails are fully exposed to sunlight, and many of the trails have sunny stretches, fully exposed to sunlight. 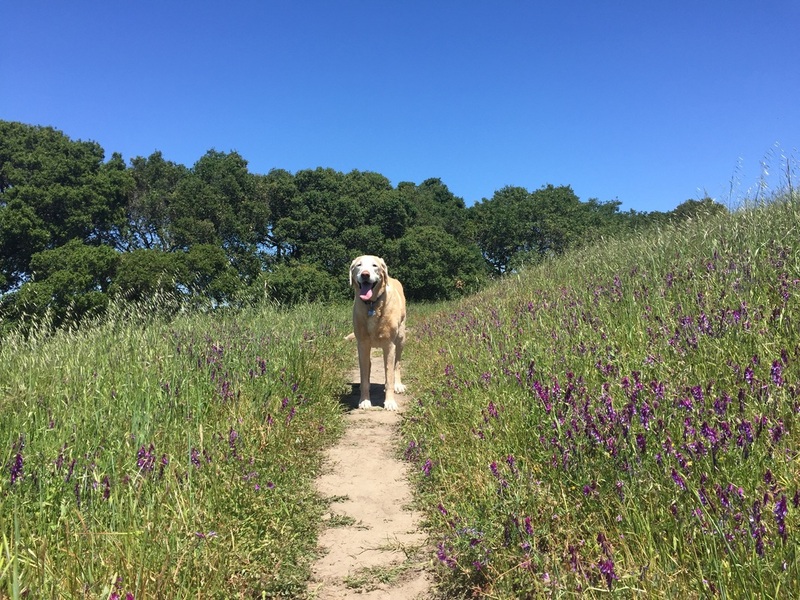 The dirt gets hot under your dog’s paws. 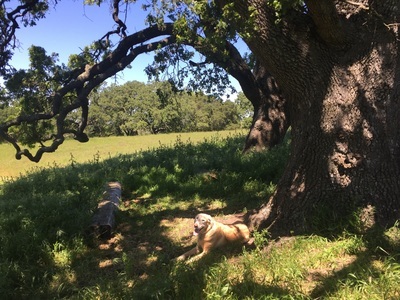 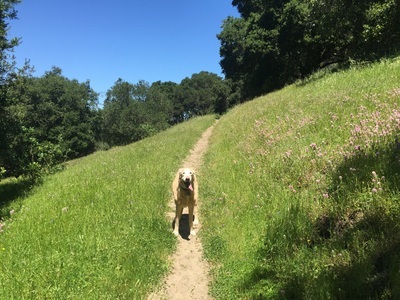 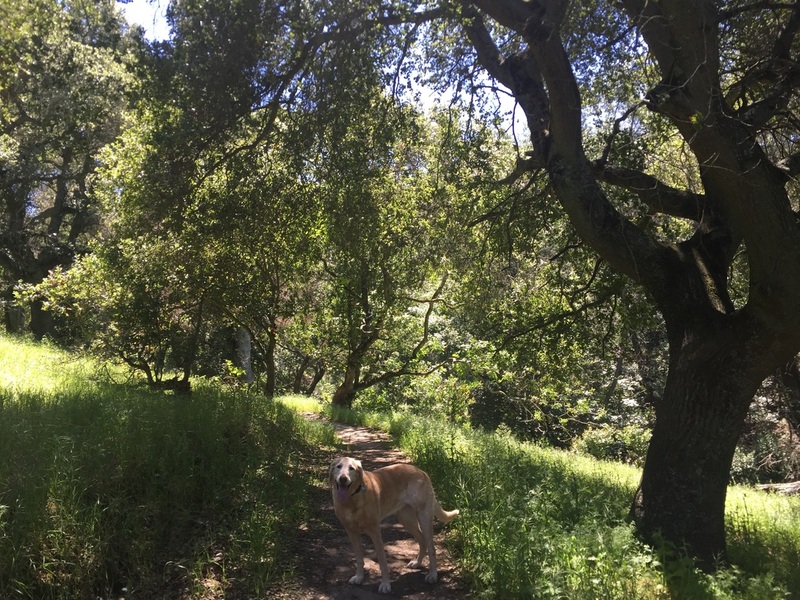 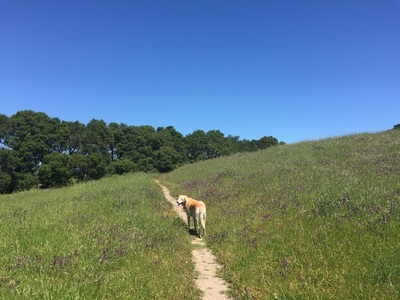 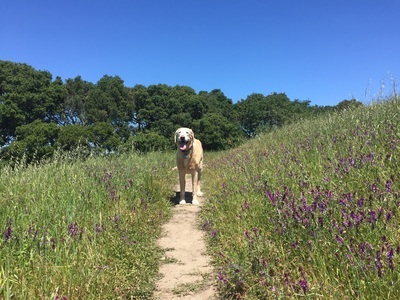 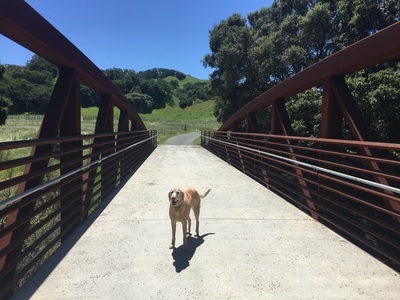 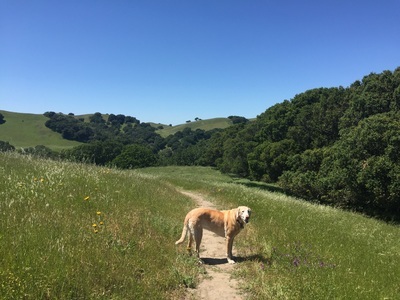 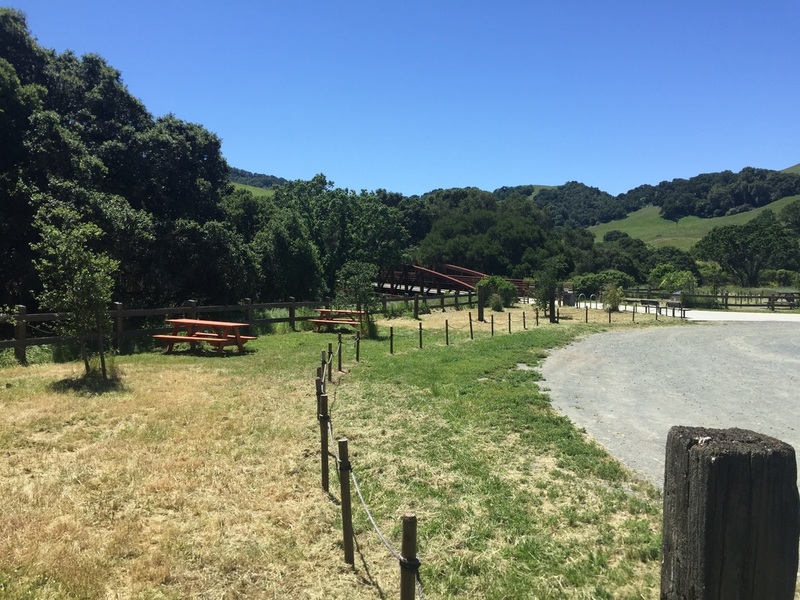 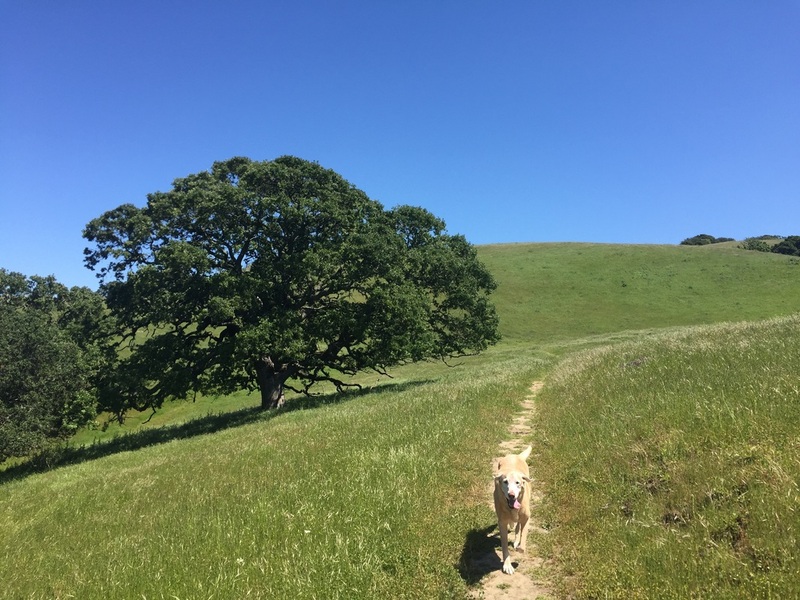 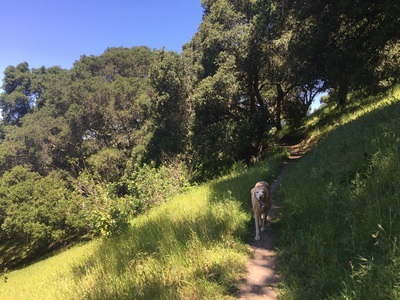 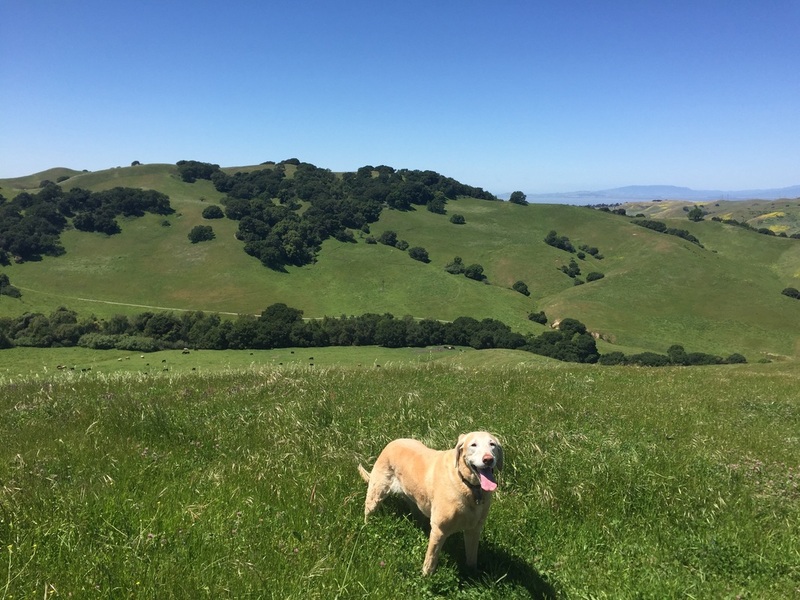 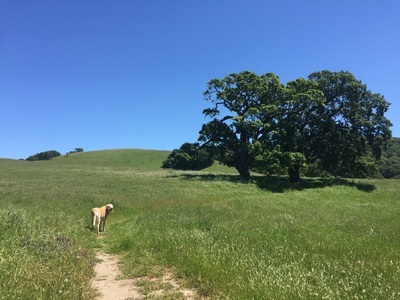 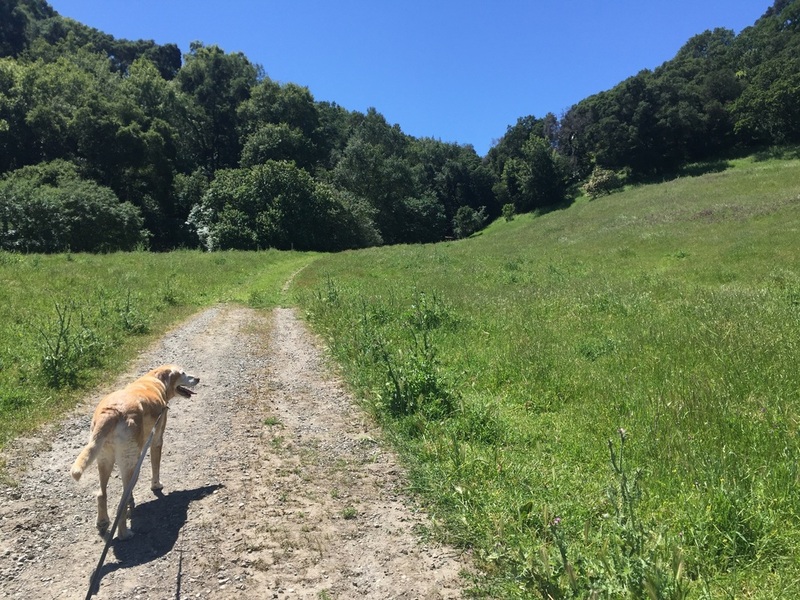 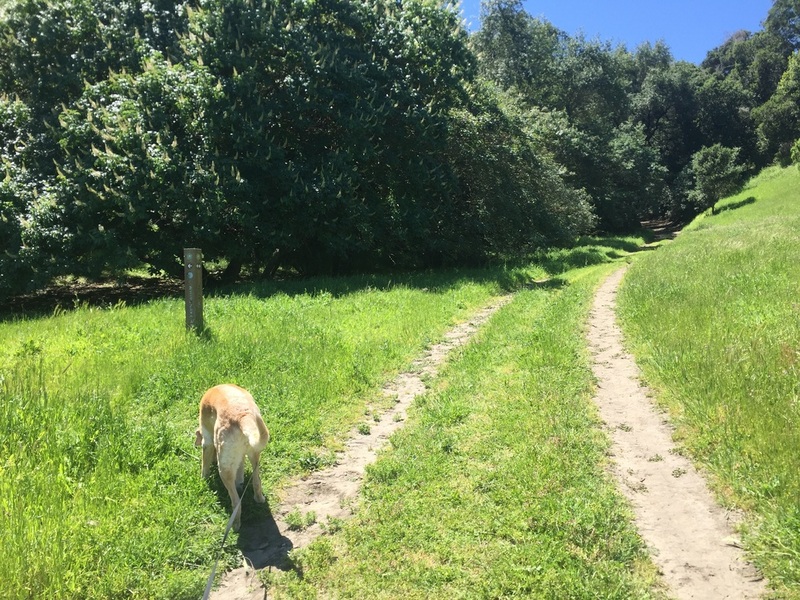 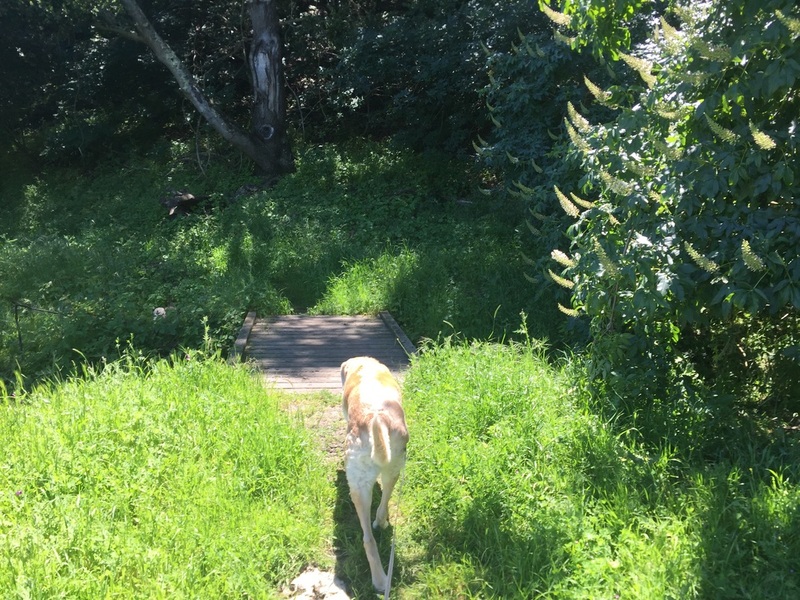 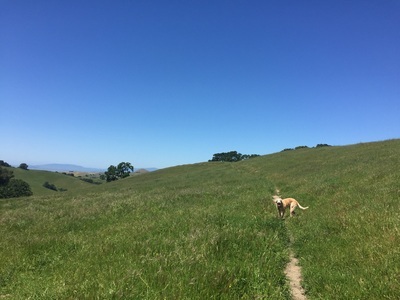 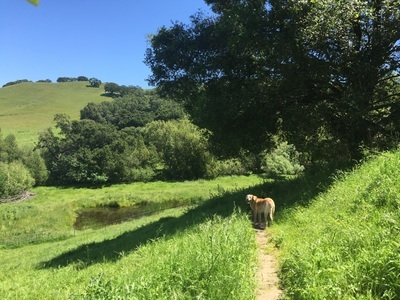 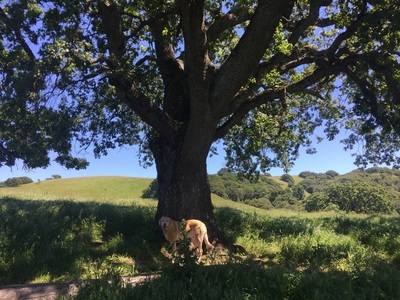 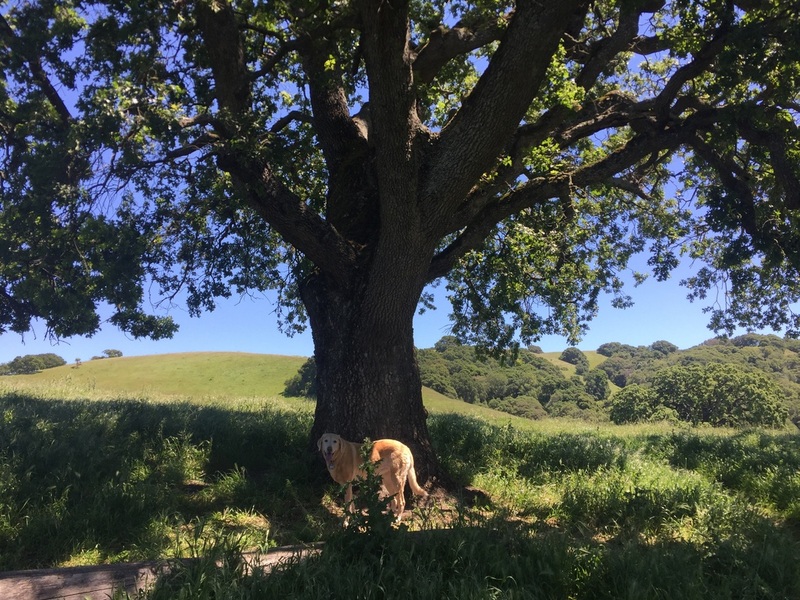 Description: This is a beautiful dog-friendly 700-acre park with ridge top views. 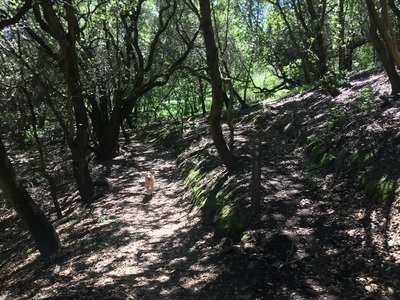 The initial trail is hot and dry, fully exposed to sunlight. 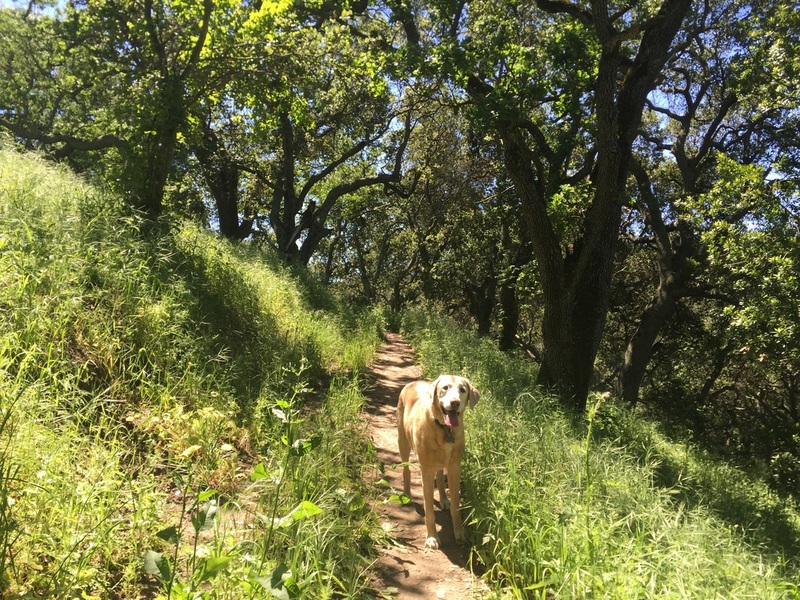 Once you reach the Whipsnake Trail, many of the trails have intermittent shade under forests of oak trees. 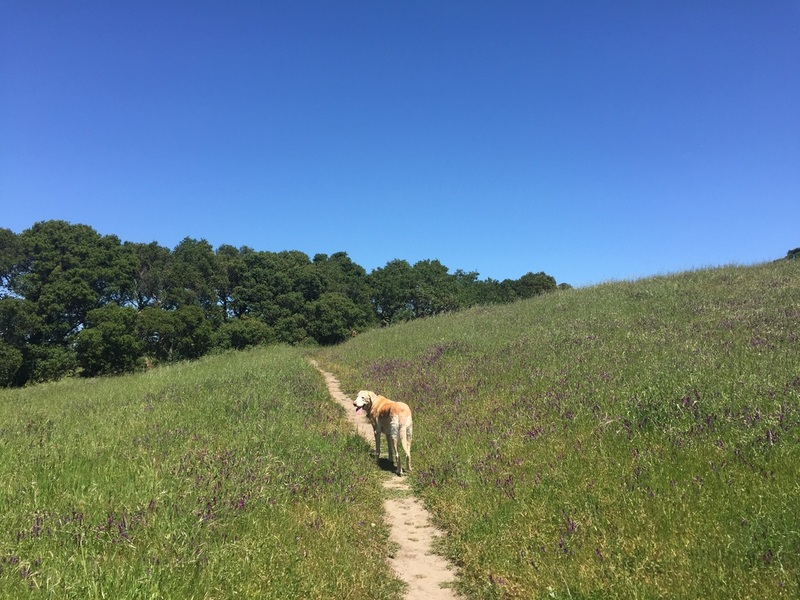 You can hike up along the hillside, dotted with purple and yellow wildflowers, until you reach a lookout point with views of the bay. 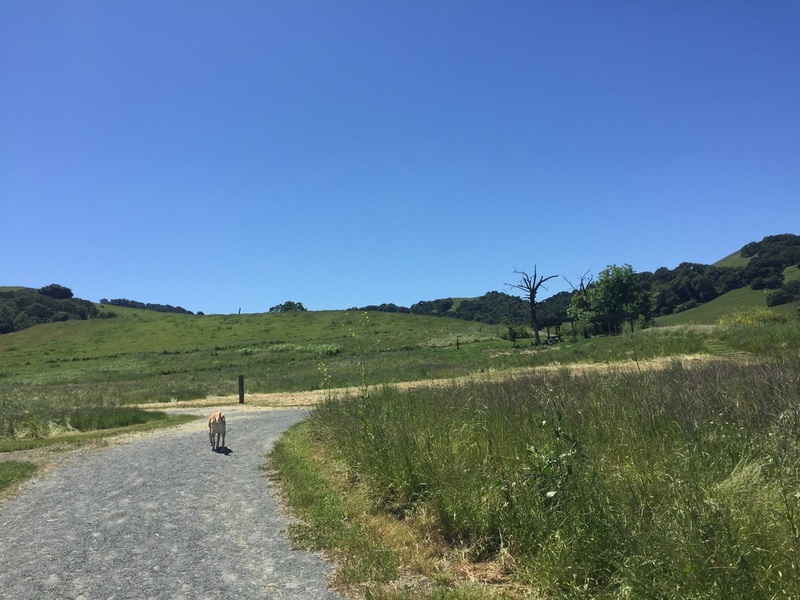 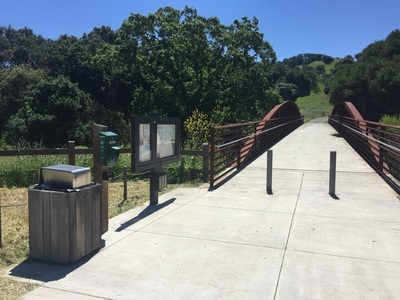 We noticed that the trails closest to the parking lot are undergoing maintenance, and weeds and high grass are being cut down. 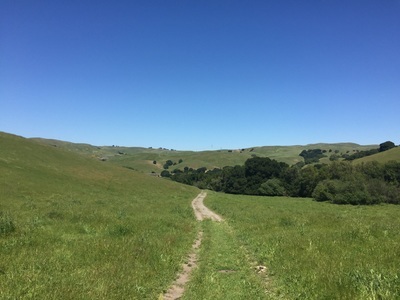 A few stretches of trails on the hillside are overgrown with tall grass, so be careful and wear long pants during your hike. 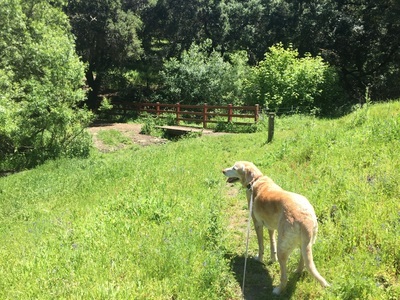 Although we saw grazing cattle in the distance, we did not run into any during our hike. They stayed near the creek away from the trails. During our hike, we hiked to the viewpoint overlooking the bay, which was approximately a 3.5 mile round trip hike with 300ft of elevation gain. From the parking lot, proceed over the bridge and up between the two shaded picnic tables. 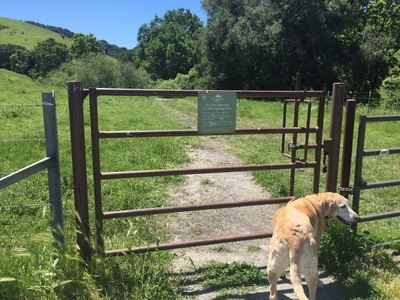 Continue on the Windmill trail to your right, through the cattle gate. 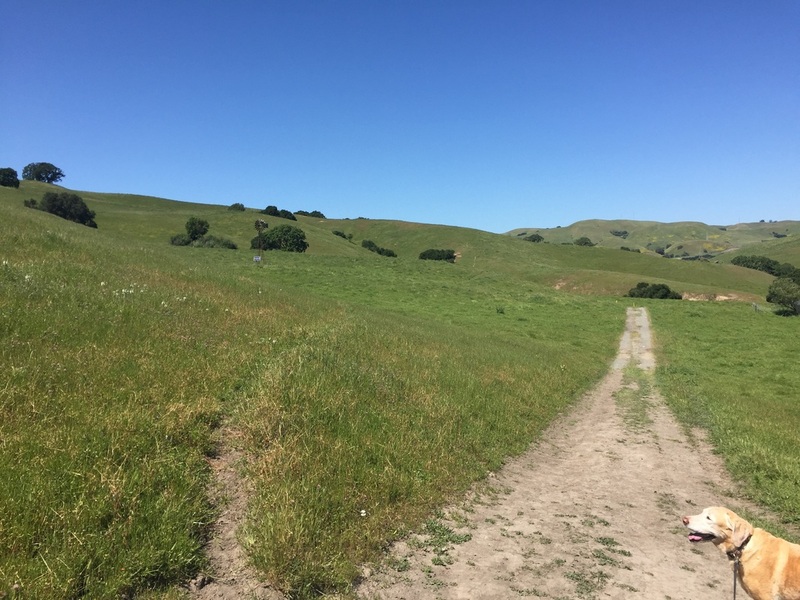 After a couple short hills you will see a windmill on your right. Hike over another small hill and you will see a sign for the Windmill Trail on your left. Cross a small bridge, hike through the shaded forest, cross another bridge, and you will pass through another open cattle gate. 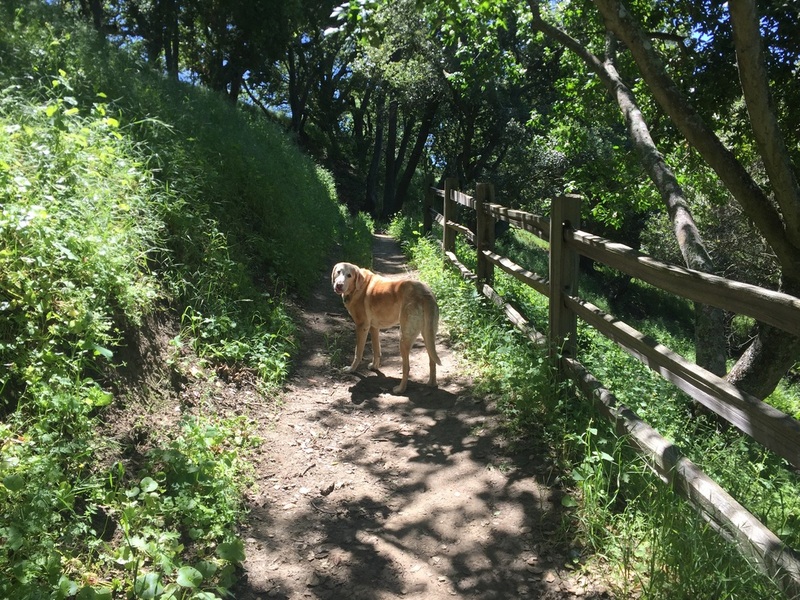 Stay to your right and head up hill. 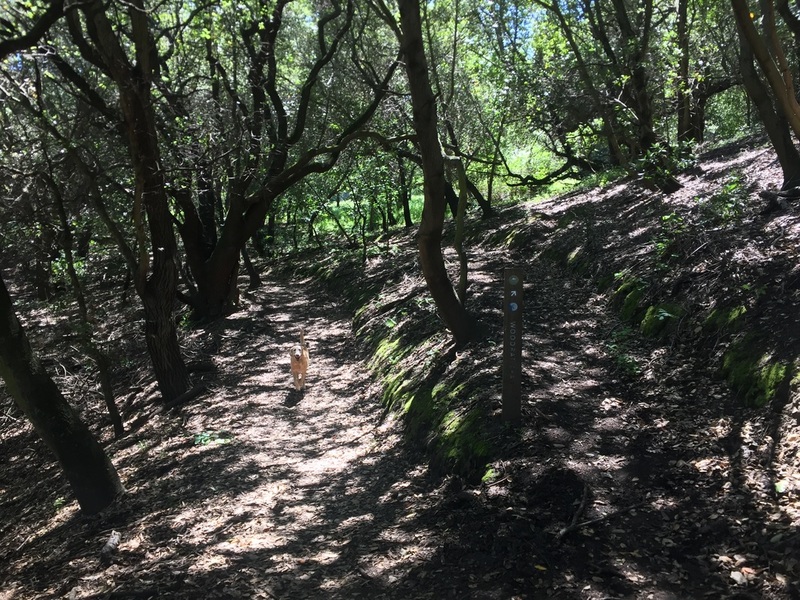 After several switchbacks through shaded trails, you will emerge on the hillside. 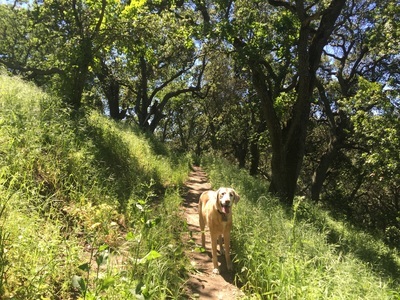 Pass a large tree and continue on a trail, which will eventually lead you to the left. You will soon see a wooden bench and you will have a view of the bay. Head back for a 3.5 mile round trip hike. 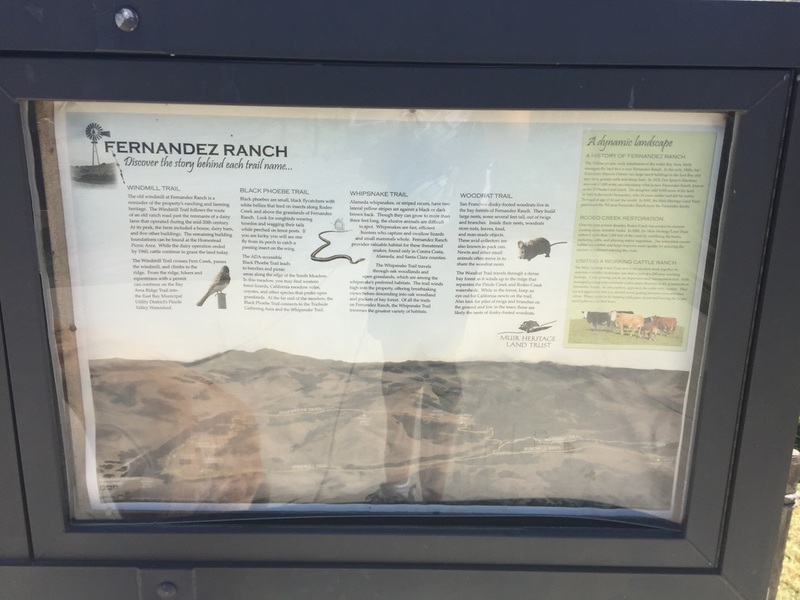 Or you can continue on the trail and back where you started from the Black Phoebe Trail. 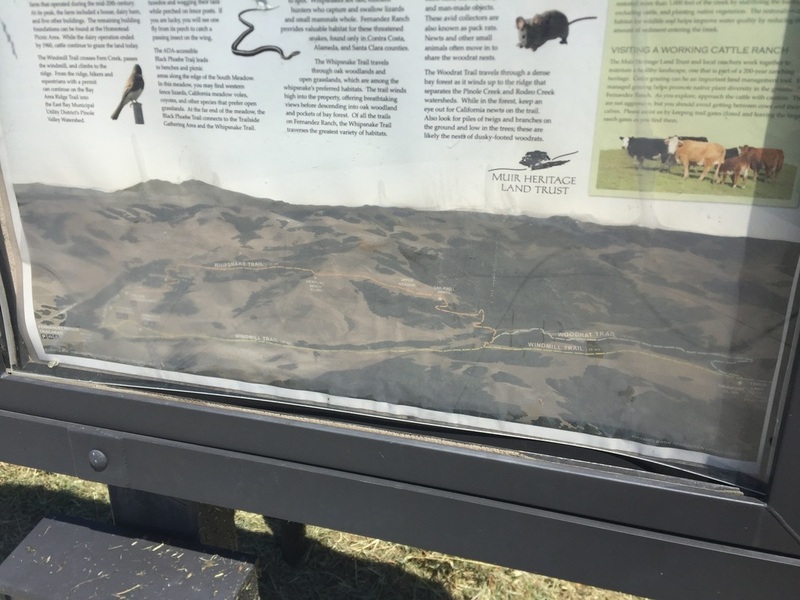 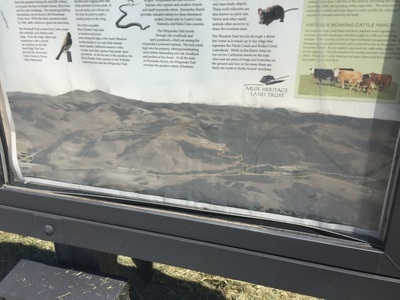 You can also loop the Woodrat trail on your way back. This park has multiple picnic tables, a pit toilet in the parking lot and doggy clean-up bags at the trailhead. 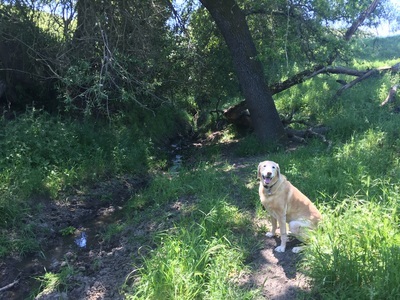 No running water is available so pack in plenty of water. 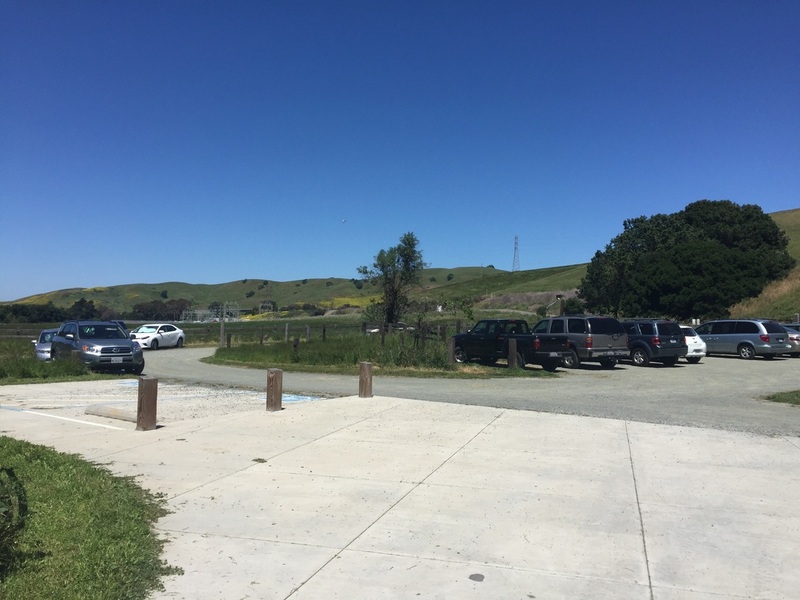 A note on reaching the park: The park is secluded, and you will probably lose cell phone reception reaching it. 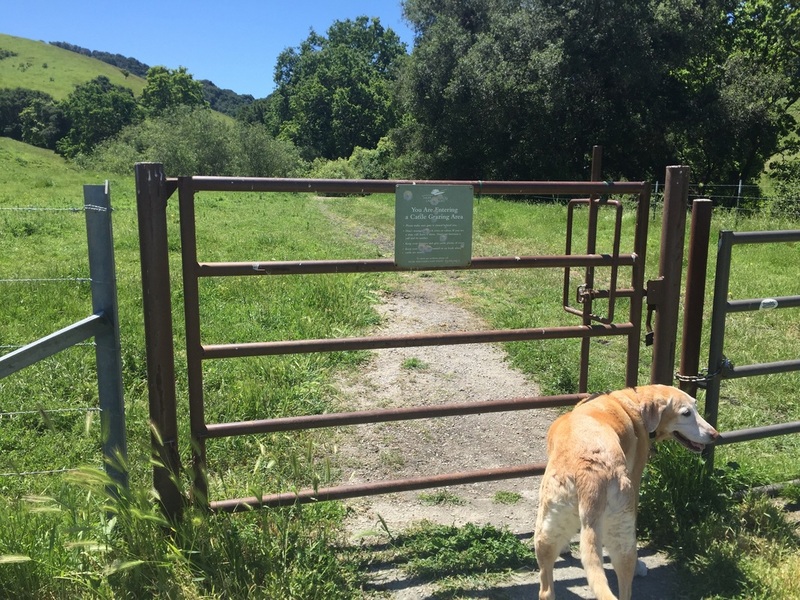 You will need to exit CA-4 E on Christie Road, which is an abrupt exit down a dirt road that says it’s a dead-end. 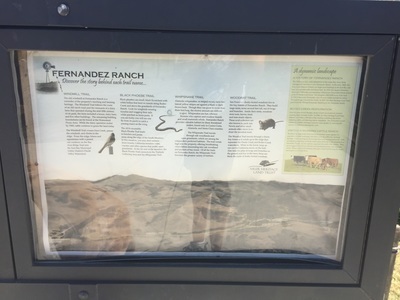 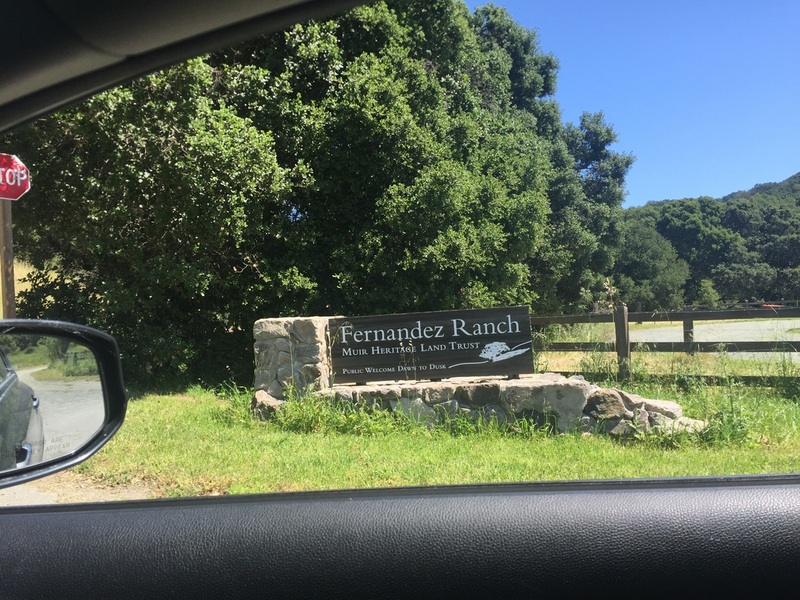 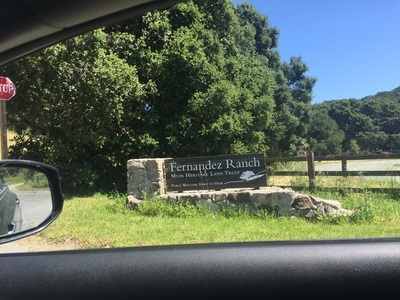 Proceed about 0.6 miles down the road, passing a house and train tracks, and you will see a dirt parking lot with a “Fernandez Ranch” sign. When exiting the park, you will need to enter the freeway at the same place you exited. 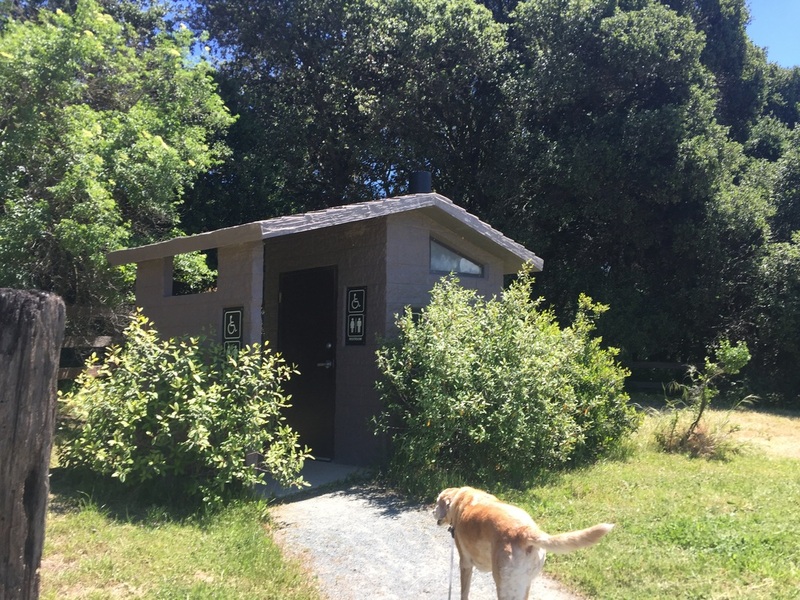 It’s a little tricky because you’re entering after a stop sign on a freeway with cars going 55 MPH. Take your time and be cautious.